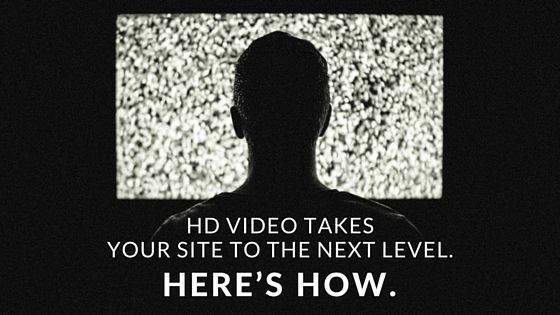 HD video takes your site to the next level. Here’s how. Studies show that one minute of video is equivalent to 1.8 million words — so we can all agree videos are some pretty powerful things. It’s why adding video to your site can help you with messaging in a way words and photos just can’t. Most people would prefer to watch a video about your company rather than read about it — and studies predict that video’s popularity will continue to increase in coming years. Here are five ways adding HD video to your site can take your online presence up a few (big) notches. 1. Search engines dig videos. Search engine algorithms are designed to bring users the best possible results. Having organic content like videos on your site signals to search engines that you’re the real deal. Because if you have good content on your site, visitors are going to like what they see. That’s why videos can do great things for your SEO — and being popular with search engines means more eyes on your site. 2. Videos tell your story. Video is the best at telling stories, and your site is where you should tell your customers who you are and what you can do for them. Written copy and photos just can’t compete with video when it comes to communicating directly with your customers and making an emotional connection. 3. Videos sell your product. Video of your product shows visitors its great quality way better than photos or a description. Video helps sell product and there’s proof: Viewers are anywhere from 64–85 percent more likely to buy after watching a product video. A product video is the best way for customers to know exactly what they’re getting — and for you to show them why they can’t live without it. We consumers have a pretty short attention span these days. We need things to grab our attention fast, because if they don’t, we move on in seconds. Videos are the best at capturing attention. There’s little work involved on our part and our brains love it. A great video can pique a visitor’s interest, making your site a place where they want to stay. When people watch a good video, they want to share it with others, creating a better buzz about your business. When people share your videos across social media, it increases the chances that people will visit your site to see more about what you’re all about. We do video — and we’re awesome at it. We can send a director to your business to help you tell your story with a documentary-style video. Call 844-207-9038 or email hello@mopro.com to learn more about how we can make your site stand out online.